Spring weather in Central Florida is moody and sometimes downright bipolar. You can be blessed with warm, summer-like days, the beaches filled with bikini-clad sun-lovers, or cold stormy skies and near freezing temperatures. Participants at the 13th Sweetwater Symposium got to sample a bit of both moods. After a year’s hiatus the 13th annual Sweetwater Symposium was held Feb. 26 – 28, with BCU/ACA/Greenland week starting Feb. 22. Although the week started with balmy temps in the mid seventies, by Saturday a cold front bringing arctic air had paddlers bundling up in full winter gear. Dry suits in Florida? Yes, it is true. 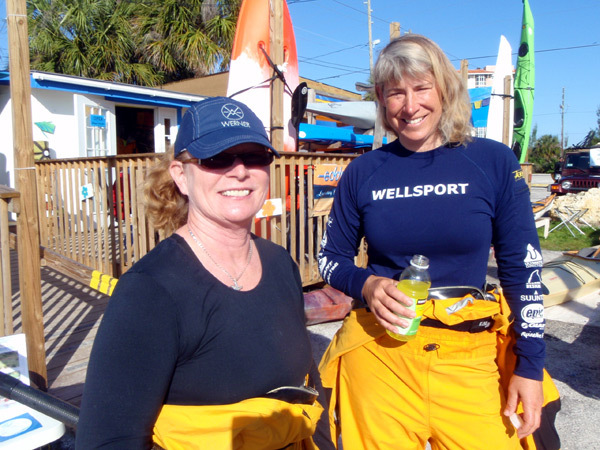 Fortunately Suzanne Hutchinson, Kokatat rep, was on hand to discuss drysuits and help paddlers with new gaskets. I was happy to have brought my Kokatat drysuit and storm cag — the same gear I wore in Iceland and Newfoundland. It was the first time I have ever needed it in Florida at midday. The cold front blew through Saturday afternoon creating some very fun and challenging conditions and paddlers were soon greeted to blue skies with warm temps on Sunday. “This is more like it”, one participant grinned, as he strode by me in shorts and sandals, on his way to the water.